We had great weather, 144 wonderful participants—and a bunch of uninvited guests at our first meet of the fall at Orangevale Community Park. Those guests were a swarm of angry yellowjackets upset when orienteers inadvertently smashed their nest. They responded in kind, stinging several participants. 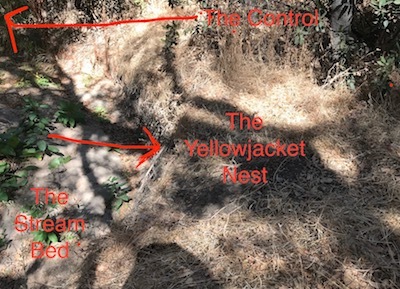 Their nest was hidden in a dirt stream bank that was one route choice to get to the sixth control on the Orange course (see photo). The nest was also close to the trail taken by white participants, so several of them got stung, also. The yellow folks lucked out! So we told orange folks to skip that control (everyone got credit) and pulled the control as the yellowjackets calmed down. We had a great showing of young people: JROTC units from our co-sponsor Casa Roble High School right across the street, plus Del Campo in Fair Oaks, McClatchy in Sacramento, Valley in south Sacramento, Whitney in Rocklin and Carson from all the way over in Nevada. We also had Sacramento State students and Boy Scout troops. So, a quick Teaching Moment for all those students (and the adults who kept calling the insects "bees"): Yellowjackets are sometimes mistakenly called meat bees, given that they are similar in size and sting, but yellowjackets are wasps. Yellowjackets, in contrast to honey bees, have yellow or white markings, are not covered with tan-brown dense hair on their bodies, do not carry pollen, and do not have the flattened hairy hind legs used to carry it. They do have lance-like stingers with small barbs, and typically sting repeatedly; the venom, like most bee and wasp venoms, is primarily only dangerous to humans who are allergic or are stung many times. 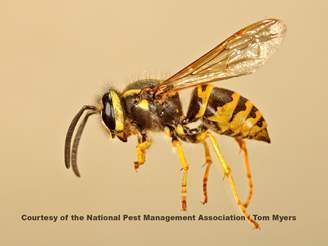 Yellowjackets build nests in trees, shrubs, or in protected places such as inside man-made structures, or in soil cavities, tree stumps, mouse burrows, etc. They build them from wood fiber they chew into a paper-like pulp. They eat insects, nectar and fruit (and like people food). But enough about yellowjackets. The white course was won by Greg Mandler, in his first of three courses, in 23:10. Daniel Roberts of GCO and Boy Scout Troop 386, took yellow in 35:08. Carson JROTC students dominated orange, taking the top six places. First was Jared DeSelms in 42:56. A couple of ball caps got left behind, probably in the yellowjacket panic (one was found under control No. 6). One is blue and camo and says "Ford." The other is black and gold and says "Caterpillar." Contact the meet director at 916-922-8671 to get them back. Also, Casa Roble JROTC volunteers did a LOT of the work! They lugged around equipment and set up the registration, start and finish stations; they helped run starts and finishes AND they picked up 41 controls! A big Thanks to Lt. Col. Kevin Houdek, Cadet-in-Charge Joe Bizzy and volunteers Dylan Creed, Gamaliel Victoria, Joseph Lawson, Josh Mainwaring, Dalton Branson, Daniel Cohen, Michael Fragnito, Amberly Hackmann, and Thomas Cherry.